Ashlee Simpson And Pete Wentz Welcome Baby Boy. Well the rumors were right last night. Congratulations to them both! I bet Ashlee is just as relieved as the rest of us that she finally pushed that thing out. Last April Us Weekly broke the news that Simpson, 24, and Wentz, 29, were expecting. During her pregnancy, Wentz — whom she wed in May — doted on her, often fetching her No. 1 craving: green olives. So what’s up with the crazy name Bronx Mowgli? PEOPLE has an idea. … it’s just the latest demonstration of her Disney devotion. 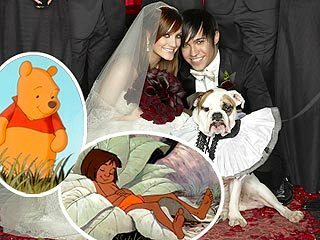 While Simpson and husband Pete Wentz … haven’t yet discussed the inspiration behind the baby’s unique moniker, “Mowgli” is, of course, the lead character in Disney’s animated classic, The Jungle Book. previous post: Ashlee Simpson Is In Labor. For Real This Time?